Creating a panel for a panel form aviary is a relatively simple task. Installing the aviary once the panels are all made is even easier, and the best part is, these aviaries can be taken down and rebuilt with ease. This is especially helpful if you ever need to move and wish to bring your aviary with you. Some companies may charge $150 US or more for a single panel, but now you can build your own comparable, custom-made panels for a fraction of the cost. For the panel form aviary that I built, I chose to make each panel with the top half as wire mesh and the bottom half as plexiglass. This way feed, droppings, and feathers would not be scattered around my home, but the finches would still have plenty of ventilation. Because plexiglass is pretty expensive, each panel cost me approximately $55 US in building supplies and 40 minutes (working with 1 other person) to put together. I used six panels in all, constructed a simple "catch hold" or antechamber, and laid down a floor of vinyl sheeting for approximately $380 US in total for an aviary which is 8' long x 7' high x 3' wide. This overall project cost does not include the prices for the tools I used, since I already had those on hand. A screen door. I chose to use a "Natural T-Bar Wood Screen Door" which I bought at Lowe's (a local home improvement store) for only 19$ US a piece. 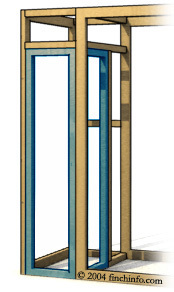 My chosen door's dimensions were: 3' wide, 7' tall, 1 & 3/8" thick. Its edges are beveled, and because it is made of untreated wood, it can be stained or painted any color you please, or left alone for a natural look. Water-based polyurethane (and any stain or nontoxic paint you may want to use) and a paintbrush IF you are using a wooden screen door. Wood is impossible to disinfect; aluminum screen doors are superior in that they can be disinfected--however, I have not worked with aluminum doors so I do not know how to go about attaching wire mesh and/or plexiglass to them. Therefore, the following instructions will be based on the assumption that you have chosen to work with a wooden screen door as your panel's frame. Although the plexiglass is easier to see through and easier to clean than wire mesh, I do not recommend making all of the panels completely plexiglass, since good ventilation is essential to minimizing a bird's exposure to disease. Lay the screen door flat with the front side down. If any screws are holding down the molding, remove them. Use a flat headed screw driver to carefully pry up the wooden molding that holds the screen down. Do not discard of the molding! Rip out all of the screen from the door (screen cannot be left as the aviary wire since it is a health hazard to finches and is easily torn) and remove any staples that were used to attach the screen to the frame of the door. You do not need to keep the screen. When you are done removing the screen from the door, it should look as pictured to the right. Stain and/or paint the wooden frame and molding if you desire to do so according to the label instructions. Some stains and paints require sanding of the wood and application of multiple coats. Once the stain and/or paint is applied and dried, apply at least 2 coats of water based polyurethane to protect the wood. Let dry. Place the lucite and/or wire that has already been cut to size into position on the wooden frame. If using lucite, gently (slowly) predrill several strategically placed holes in the lucite as pictured below. Fasten the lucite to the frame with the ¾" screws and fasten the wire to the frame with a staple gun. Be warned that placing too much pressure on the lucite (weight or tightening the screws too much) will cause it to crack. Replace the molding and fasten it back to the frame with staples and/or screws. You have just completed a panel. Repeat the above three steps for as many panels as your project requires. Photos from left to right: plexiglass placement, drilling into the plexiglass, wire placement, stapling the wire, and stapling the molding back into place. Note*: The 2×2's are used in the construction of the antechamber as well as for supports along the top length of the aviary (beams to help keep the aviary width constant). An antechamber is a small "add on" to a walk-in aviary that serves as a catch hold to prevent the escape of any birds. It should have two doorways: one as an entrance into the antechamber, and the other as an entrance into the aviary. Build the antechamber as wide as you need to comfortably maneuver (with arms full of dishes, sometimes) from outside of the aviary to inside. The doors to the antechamber should be as short as possible while not making entry for you uncomfortable. Building the doors to be the full 7' height of the aviary is not advised since the birds often fly upwards when startled and having high doors makes their escape more likely. The graphic to the right exemplifies how the antechamber I built functions: when the inner door is opened, it closes off the opening to the outer door. Note that the doors share the same dimensions, and that both are roughly a foot shorter than the rest of the aviary. To connect two side panels to each other, lay both pieces face-down (so that the side with the molding is facing up) on a level surface adjacent to each other with the tops and bottoms of the panels lined up. Place 6 straight brackets at equal distances from each other along the entire length of the seam joining the two panels. Make sure the spacing between the two panels is as tight as possible; if you can pass a pencil through the gap, the panels are too far apart. Once everything is in place, predrill holes for the brackets and then screw the straight brackets into the panels as pictured on the left. The brackets can be painted to match the aviary if desired. Repeat this step until the sides, front, and back of the aviary are as wide/long as you would like them to be. With someone helping you, stand one side of the aviary upright and place it adjacent to the back panels (also held upright) on a level surface. Make sure the tops and bottoms of the side panels and the back panels are lined up and make sure the gap between the side and back panels is as narrow as possible. 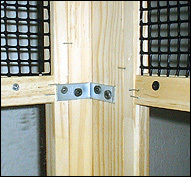 Connect the sides of the aviary to the back of the aviary using corner brackets as pictured on the right. I suggest using at least 4 corner brackets spaced equally apart to achieve this. Again, you may want to paint the brackets to match the rest of the aviary frame. Repeat this step to connect the other side of the aviary to the back of the aviary. Once you have completed step 2, your aviary should look something like the picture to the left. 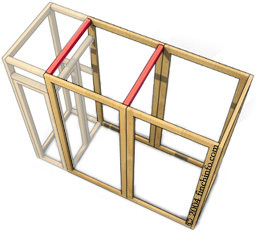 For every 2 side panels that are connected to each other, use a 2×2 that is cut to be as long as the aviary is wide to help maintain the width of the aviary. Hold the beam horizontally across the top of the aviary, connecting one side to the other as pictured on the right (the beams you are adding in this step are tinted red in the drawing). Screw each beam into place using at least 2 long screws on each end. Once you have decided on the dimensions of your antechamber, build it to suit your needs. 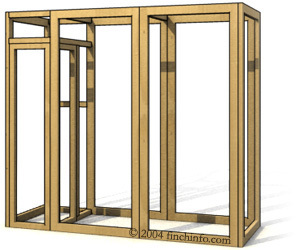 The front of the aviary/antechamber (opposite the back end of the aviary) should be constructed of panel(s); the remainder of the antechamber is made with appropriately sized 2×2's. For my antechamber, I chose to make 6' tall by 1½' wide doors out of 4 2×2's. I connected the 2×2's using Elmer's wood glue and 2 long screws at every joint. After the doors were dry, I stapled wire mesh to them. Each door opening should have a lintel above it, and if necessary, a stud beside it to attach wire to as well as to frame the door (see photos below). Hang the doors with the hinges, give each door two door handles (one on each side of the door), and place a hook and eye or other locking device on the outside of each door to keep the door(s) shut while not in use. 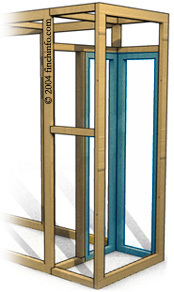 Above is a schematic (opposing side views) of the antechamber I built; the doors are tinted blue. Please make note of how the 2×2's and the front aviary panel are arranged to form the antechamber, complete with doors. Once the antechamber is built, cover all openings with wire mesh cut to size, and staple the mesh to the wooden frames on the inside of the antechamber. You will need to decide on what flooring option is best for you. Because I built my panel-form aviary as an indoor enclosure, I simply laid down a sheet of vinyl tiles cut to size underneath the enclosure. I find them aesthetically pleasing and very easy to keep clean. Outdoor enclosures will need a much sturdier flooring that is physically secured to the bottom of the aviary so that vermin cannot dig through it. For the "roof" of my aviary, I simply cut a large strip of hardware cloth and stapled it to the top of the structure. Outdoor enclosures will need at least a portion of the roof to be covered in a material which can protect against the elements (rain and sun, etc.). Add clean perches, dishes, and other accessories (such as nontoxic plants) to your aviary. If it is an indoor enclosure, place a full spectrum light on top of the aviary. Lastly, release the birds into it and enjoy!